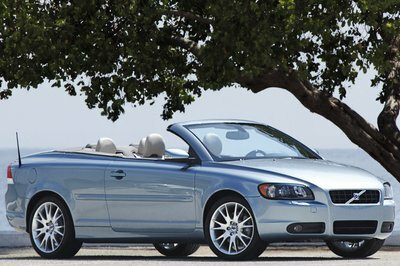 2006 Volvo C70 Coupe and Convertible Review. It was the introduction of the C70 in 1997 that cracked the conservative, stodgy mold of Volvo's character. If there were any pieces of that mold clinging after almost a decade of fresh product releases, the 2006 Volvo C70 has left them in its dust. Base priced, including destination charge, at $39,405 with the six-speed manual transmission and $40,655 with the five-speed automatic, the new-generation midsize C70 will make its appearance in showrooms this spring. This four-seater coupe/convertible cranks up charisma with a slick new form highlighted by a retractable hardtop that allows it to change personality in seconds. The C70's edge is its "two-cars-in-one" appeal, offering the advantages of both a sleek, precise-fit hardtop and open-air convertible. With a touch of the button the three-piece top begins its show, splitting apart to fold into the trunk, than out again - operations accomplished in about 30 seconds in each direction. With out the top up, the trunk provides a relatively spacious 12.8-cubic-foot storage capacity. When the top makes its home in the trunk, storage is reduced to 6 cubic feet. Body styling is clean and sophisticated, a bit understated and definitely recognizable as a Volvo - featuring traditional cues such as a short front overhang, subtly rounded corners and strong shoulders. In terms of exterior dimensions, the 2006 model is about the same width, but 5.4 inches shorter in length and with a 1-inch shorter wheelbase. It sits lower and has a slightly shorter nose that Volvo touts creates a more powerful and athletic look. In sync with its more muscular appearance is a potent powertrain and a balanced performance character, making the C70 exciting to drive. Power is sent to the front wheels via a T5 2.5 liter inline-five-cylinder engine. Boosted by a light pressure turbo, this powerplant delivers 218 horsepower and 236 foot-pounds of torque. With the manual transmission, its 0-60-mph time is 7.6 seconds. Well-planted wheels, Dynamic Stability and Traction control, and on-center steering contribute to high-speed agility. Traction comes via 235/45/17 tires wrapping aluminum wheels with forked spokes. Eighteen-inch wheels and 235/40/18-V Rated tires are a $995 option. The T5 is offered with a choice the two aforementioned transmission mates - a six-speed manual and a five-speed automatic with "Auto-Stick" manual shifting mode. Shifting the real manual is a slippery operation, great for those liking sophistication over notchy, traditional sports car feedback. The auto transmission slips into manual mode with a right tap of the lever into a vertical slot. Moving the lever forward upshits and backward downshifts. Driving the C70 on twisty roads and hilly terrain, the "Auto-Stick" feature was greatly appreciated. The leather-grip shift lever is planted in the lower slop of a trim, refined-looking brushed-aluminum-accented center control panel. The steering wheel is leather covered, with an attractive aluminum strip lining the underside of the upper arc. The steering grip, enhanced by bulges, has a substantial feel. Leather seats are an option that comes as part of a $1,395 Premium Package. Eight-way power adjustability on driver and front-passenger seats is standard. The front buckets are aggressively bolstered and supportive to provide comfort for long-term driving. Headrests are large, padded and contoured for excellent support. 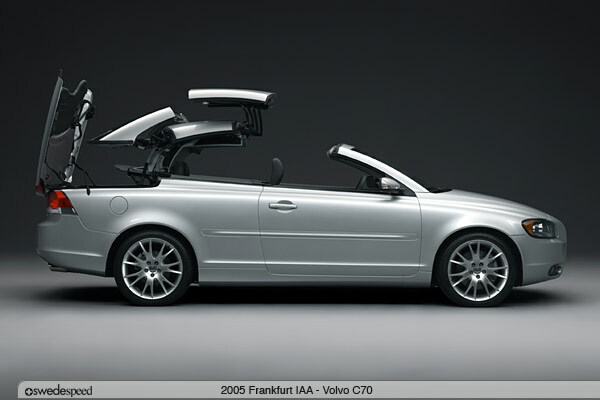 Safety has always been the key feature for Volvo cars and the Volvo C70 is no different. Rollover protection system, Whiplash Protection System, front, door, rear side bags with Side Impact Protection System are all safety enhanced systems for the C70.